The stock market held firm last week, even though some of the economic data was weaker than expected. The final reading for 2018's Q4 GDP came in, as expected at 2.2% on Thursday. While the Trump administration is looking for a 3% GDP in 2019, the growth is not currently that strong. For example, the Atlanta Federal Reserve's GDPNow tool forecasts economic growth of only 1.7% for the first quarter. The declining yields in the global bond market seemed to also warn of a weak economy. However, the bond market was ignored by the major averages, which recorded solid gains for the week. The Dow Jones Transportation Average was the strongest, up 3.54%. It was followed by a solid gain of 2.25% in the small cap Russell 2000. Both of these averages still ended lower for the month. Both averages have recorded solid gains for the quarter, and have done better than the 13.1% Q1 gain for the S&P 500. For the month, the Spyder Trust (SPY) was up just 1.8%, but that was the third higher monthly close in a row. There is monthly chart resistance (line a) now at $298.04. The monthly S&P 500 advance/decline line made a significant new high in March. During the entire bull market, it has only been below its WMA in early 2016 (point b). During the sharp decline last fall, it was the positive action of the monthly A/D line that kept me positive on the major trend. The monthly A/D line declined towards the rising WMA in December, but has been positive since March of 2016. The daily trend analysis was neutral a week ago, but then turned bullish with Tuesday’s close, which was a reason to do new buying. This was the top Q1 performance since 1998, when the SPY closed up 12%. So what happened next in 1998? On the weekly chart of the NYSE Composite, I have noted the March 1998 close (vertical line a). The NYSE continued to move higher until July, as it gained another 5% before the Russian ruble crisis hit the markets in late July. The weekly NYSE A/D line dropped below its WMA in the middle of May, and only rallied back to its declining WMA as the NYSE was making its new high. The significant negative divergence (line c) sent a strong warning that the market was topping out. In my course on A/D line analysis, I point out that the daily NYSE A/D line dropped below its WMA two days after the July high. Before the market’s 30% decline was over, hedge fund Long Term Capital Management needed a $3.6 billion bailout. Though there is no reason to expect history to be repeated now, the 1998 experience does warn investors not to become complacent. For the month the top three sectors were real estate, technology, and consumer staples. In last Monday’s “Top Sector Spotlight” I focused on the Consumer Staples Sector (XLP). 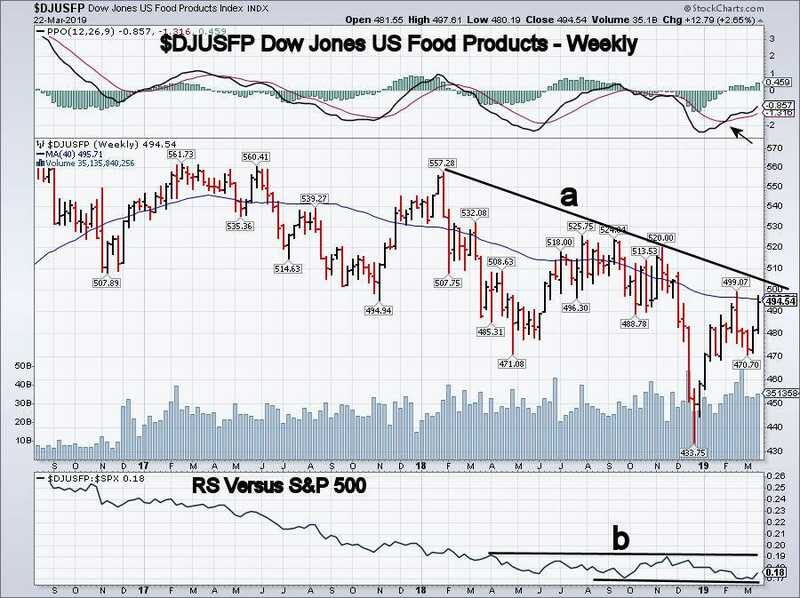 Of course, within any sector, you can look at the individual industry groups in the sector, such as the Dow Jones US Food Products ($DJUSFP) as well as stocks. The stock I liked was Hormel Food (HRL), which was up 2.8% last week. The relatively weak economic data last week did not help the decline in yields, as the 10-Year T-Note hit a low yield of 2.356% last week, which was below the weekly and daily starc- bands. There is next support from late 2017 in the 2.300% area. The daily chart shows that yields bounced at the end of the week. The 20-day EMA is still declining sharply at 2.529% and shows no signs yet of a bottom. The daily MACD and MACD-His are both negative and declining with no signs yet of a weekly bottom. This week, we have the monthly jobs report on Friday which is preceded by the ISM Manufacturing Report on Monday and the ISM Non-Manufacturing Index on Wednesday. Clearly, the focus will be on the jobs report, as after the very weak report last month, many are expecting revisions in this week’s report. Last Friday’s release of the Core Personal Consumption Expenditure Price Index showed an annual increase of 1.8%. The is the Federal Reserve’s favorite inflation gauge and the annual rate is a sign that inflation is still currently quite low and does not support new rate hikes. It also certainly does not support the 0.5% rate cut urged by White House economic advisor Larry Kudlow. However, the inflation rate could increase in the coming months, as May crude oil was up 4.4% in March. The weekly chart shows that a doji buy signal was triggered the first week in January (see arrow). There is next resistance in the $62-$63 area. The weekly technical studies, like the On Balance Volume, turned positive in January, and the OBV is stronger than prices. The OBV is already close to the October 2018 highs (line a) when crude was above $75. The Herrick Payoff Index (HPI) formed a short term bottom in December and then moved above its WMA, confirming a new uptrend. In last week’s post, I pointed out the weekly and daily divergences in three of the key advance/decline lines, which in my view warranted a cautious strategy by traders. These warning signs were reversed by last Tuesday’s close which means the next significant move is now going to be higher, not lower. Still, one needs to be selective, as some sectors, like the financials, are performing much weaker than the S&P 500. Currently, there are more stocks that are just coming out of their trading ranges, and therefore offer better-risk buying opportunities. Those who followed the four-week dollar-cost averaging plan I recommended before Christmas, are still 75% long at an average price of 2497 based on the S&P 500. On February 25, 25% of the position was sold when the S&P 500 moved above 2805. As a stop on the position, sell the remaining position if the S&P 500 has a weekly close below 2597, which is Quarter 1's QPivot. In my Viper ETF Report and the Viper Hot Stocks Report, I provide my A/D line analysis twice each week with specific buy and sell advice. 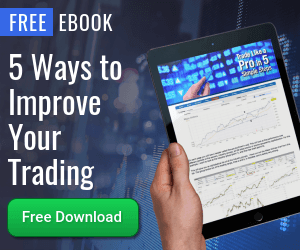 New subscribers also receive six trading lessons.